A parabolic reflector is used in many antenna systems to focus energy down to a smaller spot size. The slang term for parabolic reflector is a "dish". Time for another Microwaves101 Rule of Thumb! Thanks for the correction, Vincenzo! This rule is attributed to Robert E. Collin, in his book, Foundations for Microwave Engineering. Click here to go to our page on recommended books on all microwave engineering topics. Robert Collin wrote some outstanding textbooks back in the 1950s and 1960s. From our "what's the frequency" page we know that the frequency of the Dish Network is around 12.5 GHz. That's a wavelength of 2.4 centimeters. 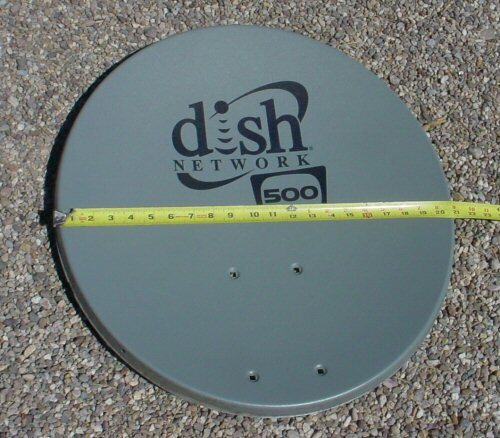 The diameter of the dish in centimeters is 53 cm, so the beamwidth about 3 degrees. For grins we chrome plated this dish and used it as a giant magnifying glass to focus the sun. Check out the results!